Being torn between my love for Italy and my wish to travel all around Europe and beyond, makes choosing of our next destination either meticulously planned or impulsive (for meticulous planning see my post about London). 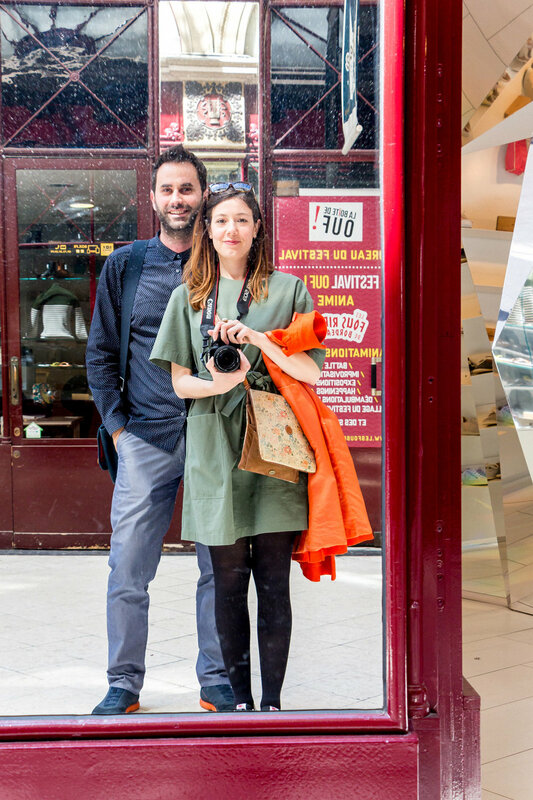 The idea of traveling to France has been brewing for quite some time, especially after falling under a spell of Mimi Thorisson's blog Manger which made me daydream about succulent French cuisine and elegant Bordeaux streets and epiceries. When I saw that there was a particularly interesting concert being held in Bordeaux in April, it took me one short consultation with Luka to book a flight for a couple of days in the region. And what better time to visit a town with wide streets lined with 18th-century mansions and a river that flows through it and into the Atlantic about 90 km later, the land of vineyards and chateaus, of magret de canard and frites and gambas flambees and wine? 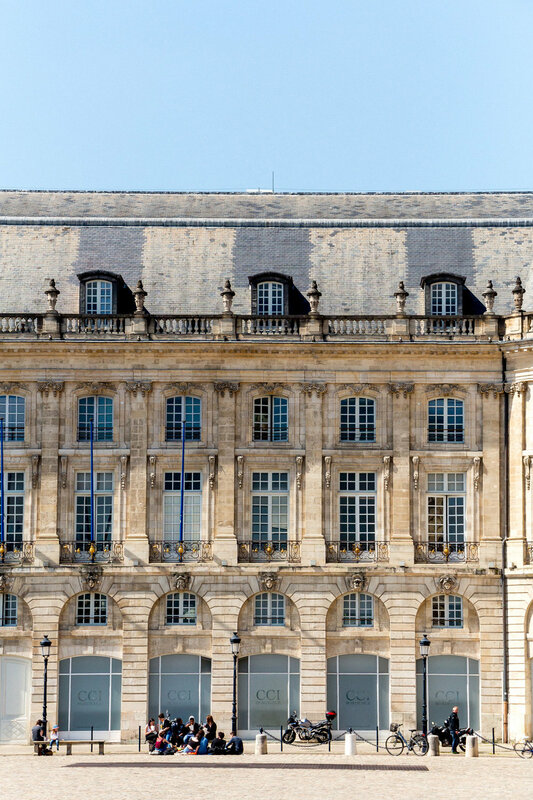 I read that the 18th century was the golden age of Bordeaux, and indeed, most of the elegant, golden-hued neoclassical buildings lining wide avenues and spacious squares, date back to that period. The Unesco listed the historic part of the city a World Heritage Site, as "an outstanding example of classical and neoclassical trends". But, after a few days in the city, it seemed to me that now is the golden age of Bordeaux as well- the town is very lively with locals and tourists alike, the dining scene is outstanding, the facades and the streets in the historic centre are well groomed, there are countless gourmand and fashion shops, the centre has limited car traffic and the public transport works nicely, the wine economy is blooming and there is a new museum dedicated to wine, the entire left bank of the river Garonne was restored and now used as a promenade where people gather, walk, run, roller skate, take their kids or their dogs out, and eat and drink at a market held there on Sundays. We booked a room with a bathroom in a family house in Eysines, just outside Bordeaux, and boy did we have luck with choosing to stay there. Not only was the house an old stone beauty with the most beautiful, very Art Nouveau glass and iron awning and old tiles with a fantastic pattern in the hallway, but also we found new friends in our hosts Charlotte and Philippe. It began with wine and blinis in their back garden on our first evening and continued with us repeatedly bringing home some delicious doughnuts and cakes from the nearby bakery, Philippe opening a bottle of wine to go with it, and then chatting about life, travel, this and that. I talked nicely about Istria, in fact so nice that the same year Charlotte, Philippe, and their three kids came and stayed at our house. Back to our first evening in Bordeaux- after wine and blinis, we headed to town for dinner. I found a restaurant on Tripadvisor that had great reviews, at the same time shabby and decadent decor and very reasonable prices. There were so many restaurants in Saint Pierre quartier that hadn't we made our minds for Melodie in advance, it would be hard to choose, with all the colorful interiors spilling out to the street, light garlands making everything look festive, fresh oysters on display luring hungry diners in, and a crowd so lively that it reminded me of a Spanish university town on a Saturday. 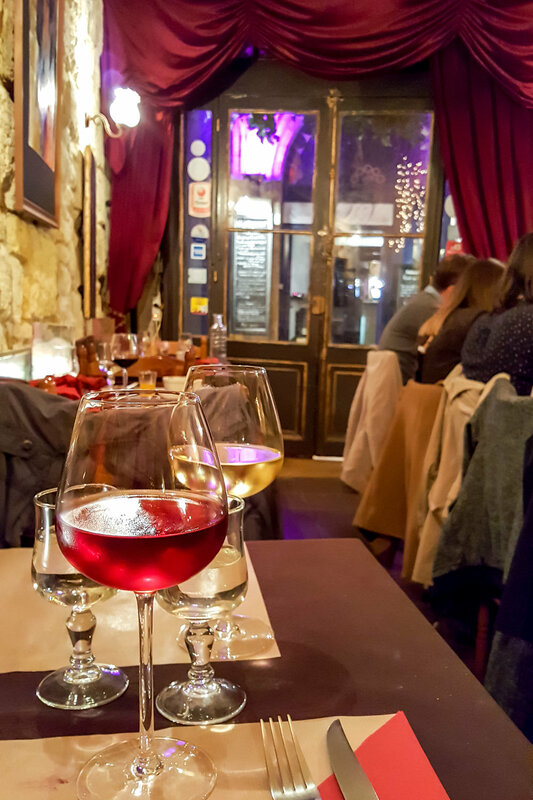 I had my first in a row of magrets de canard (duck breasts)- it was very juicy and comforting, perfect for a first evening in a new city, Luka seemed pleased with his steak as well, and after two creme brulees for dessert and two glasses of wine, we were two happy customers. We fell for the Cotes de Gascogne white wine, and even though we were in the heart of famous Bordeaux wine region, the Cotes de Gascogne remained our favorite. 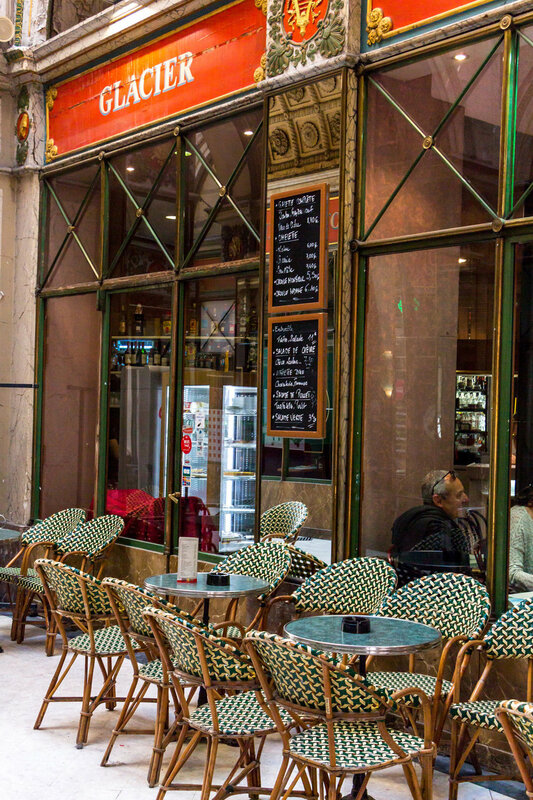 Next morning we headed to the city with the aim to aimlessly wander around, spot a couple of pretty cafes, facades, and doors, and have a fabulous French lunch, and I'm gladly informing you that we succeeded in all of it (I feel so successful now!). The first thing that is going to attract me in a new city (besides food) are the gardens, and if there is a garden in sight or on a map, we will probably end up there at some point. The Jardin Public in Bordeaux was created in the mid 18th century on 11 hectares of land with a duck pond, small botanical garden, greenest grass for picnicking and numerous plants and trees just a short walk from the center. On the day we visited, the garden was sunny and lively with walkers, joggers, and picnickers, and everything looked a bit like Seurat's painting A Sunday Afternoon on the Island of La Grande Jatte. After the park, we took a walk down Allees de Tourny, peeking into charming wine and flower shops, and a particularly famous chocolatier (so popular that people were queuing for pralines and chocolate eggs, it was Easter week after all). As we are both quite impatient persons, especially when it comes to food, we left pretty chocolate boxes and marrons glacees for some other time, confident that there were plenty more delicacies around. At the end of Allees de Tourny- an old style carrousel was spinning around unicorns, swans, giraffes, carriages and a little airplane from the 20's, and I wondered when and why did this sort of relics from more romantic times disappeared in other places. On the square, one family was playing "find the Easter egg" with their little girls, hiding chocolate eggs behind the trees and under the benches, it was such a lovely scene to watch. We took a glance at the elegant neoclassical facade of Grand Theatre de Bordeaux, but lured by the lively streets and shops went wandering around Centre Commercial des Grands Hommes, entering cheese and cake shops and buying a couple of selected delicacies with a wine and cheese evening at our hosts' house in mind. In Rue Vital Carles, a wide street heading to and looking onto the Cathedral of Saint Andre, we spotted a handful of beautiful, massive cobalt blue doors and a movie scene pretty shop window of Librairie Mollat. The Cathedral of Saint Andre was consecrated already in the 11th century, then largely rebuilt between 13th and 15th centuries, and is a real Gothic fantasy with its flying buttresses, spears, and gargoyles. It might be hard to imagine, but the cathedral served as storage for animal feed during the French Revolution and was rebuilt in the 19th century to its present shape. 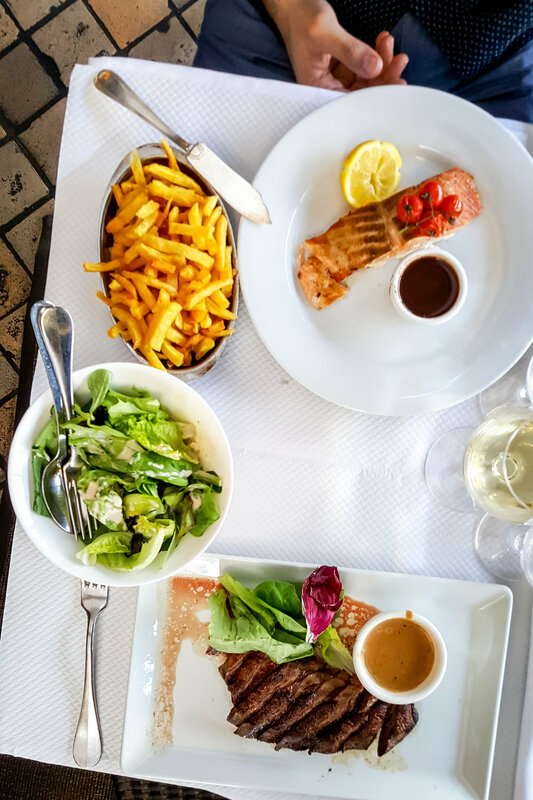 For lunch, I followed in Mimi's foodsteps (typing error intended) and sat at the traditional Le Noailles restaurant, situated on Allees de Tourny, very close to the Grand Theatre. It was a lovely day, we sat on the terrace even though the interior with wooden bar, red velvet chairs, and white tablecloths looked very inviting (I was embarrassed to go in and snap a photo of everything, so now I only have photos of food to share, but that is the most important thing, right?). I went for duck breasts again, this time with a sauce and a salad on the side, Luka surprised with salmon and frites. I think I loved this lunch the most (well, maybe a lunch we had a couple of days later in the Medoc region can compete, but more on that in my next post). Everything was delicious, but the french fries got etched in my food memory- they were crunchy, salty and perfectly buttery. 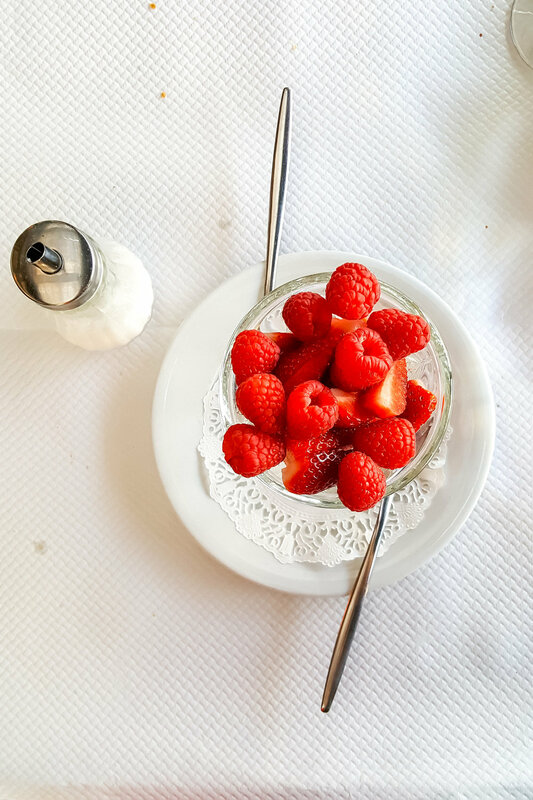 French food is heavy, so for dessert, we just split a cup of fresh strawberries and raspberries, without cream, with just a little bit of sugar. After lunch, we were still in the mood for a little more wandering so we headed to the longest shopping street in Europe, Rue St Catherine, a pretty crowded pedestrian street. I was particularly interested in Galerie Bordelaise, a 19th century covered passage with glass and steel vault and a selection of shops and bars, situated in one of the buildings blocks. For me, those galleries are oh so French, and I couldn't leave Bordeaux without seeing one. There was even a bar with green and cream Parisian bistro chairs, vintage window frames, and signs, just what I was looking for. That evening, we had a concert to attend, and we take our concerts very seriously, especially if we traveled about 1000 km for it. A couple of months before, or to be precise on Christmas morning, I found an interesting concert on Arte Tv, by Trinidad and Tobago Calypso singer, Calypso Rose. It was one of those blissful mornings when you have no errands to run, there is a festive pine tree branch in the living room, a table full of cookies, and a lunch at your parents' house that you'll later be going to. If you haven't heard Calypso music before, well, it's very energetic and fun, and with Calypso Rose even more. The atmosphere of the concert was so contagious that we spent part of the morning dancing in our living room. Anyway, the concert she held in Le Rocher de Palmer concert hall (a very cool modern building) in Cenon, a neighborhood of Bordeaux, was as fun as we expected it to be, if not more. The 77-year old sang, danced, made jokes, and everyone followed along, even the band looked in awe of her energy. The band that warmed us up before Calypso Queen appeared, Ife, was something we've never heard before; in a good way- naturally, we bought their album and it has been a favorite in our household ever since. Since we wanted to explore the region as well, the next day we drove around the enchanting (and I mean it, there are chateaus and vineyards on every corner, along with wisteria cascades and delicious food) region of Medoc, which I will be writing about in my next post (and I cannot wait). The day after, we went to the little wine town of Saint Emilion, praised by all the travel guides, and even though admittedly pretty, we didn't love it as much as we thought we would. We saved our last day for another visit to Bordeaux, and this time we focused on a part by the river. I haven't mentioned the Place de La Bourse yet, perhaps the city's most iconic sight- a horse-shoe shape square flanked with the old stock exchange on one side and National Customs Museum on the other side. The square was commisioned by Louis XV in the 18th century and designed by Ange-Jacques Gabriel, otherwise famous for Le Petit Trianon in Versailles. The architect followed the idea of returning to the prototypes of classical antiquity, creating neoclassical buildings that Louis XV admired and used as a symbol of his political power. Back in the day, a part of the city wall was torn down to give space to this new project that opened the town to the river, and I have to admit that the result is spectacular, one of the most beautiful squares I've ever seen. If you are luckier than us, you'll visit Bordeaux on a day when the Mirror d' Eau, the largest reflecting pool in the world in front of the Place de la Bourse is filled with water. Designed by Michel Corajoud and J.M. Llorca, this installation cyclically fills with water, reflecting the buildings of Place de la Bourse the way the regular floods reflect the buildings of St Mark's square in Venice- in fact, this is where the creators found their inspiration. From the Place de la Bourse, all the way to the newly built Le Cit du Vin wine museum, there is a promenade by the river flanked by neoclassical buildings, parks, playgrounds, restaurants, and bars. On Sunday, the promenade was buzzing, mostly with locals, who were taking full advantage of the quayside's recent redevelopment: some for jogging, others biking or walking their dogs; some were lying on the grass in between the flower beds, and other sipping on wine on the benches overlooking the river. When we saw that there was a food market going on as well, we decided to join the fun, bought a bottle of wine, a portion of freshly prepared gambas flambees (an elderly gentleman was cooking the prawns on a stall that he made out of a boat- we were impressed) and a savory chicken stew, sat at the little table by the river and enjoyed the sun, the food, the wine, and especially, our surroundings. By the time we got to the Cite du Vin, we were more interested in its curved lines and shimmering surface than in the exhibition itself. Along with the famous chocolatier, this museum was left for some other time (and now that we have friends in Bordeaux to get together with, I am confident we'll be back). For anyone interested, there is a nice short article about Cite du Vin here. I love writing these posts, mostly because I get to re-live my past travels, and that is a wonderful thing, don't you think? Bordeaux and the entire region were a delight, a short but sweet introduction to France outside Paris, and I'm curious to get to know more of it. My next post is going to be about a glorious sunny day spent in the Medoc region and I can't wait to share all the seaside, wisteria, chateau and vineyard photos and memories. Do you have a favorite corner of France outside Paris? Please do share, I would love to daydream about visiting it while melting in the hot Zagreb summer.